Fantasy and supernatural drama, for adults and for children, has a long and glorious history in Britain. Even before the era of TV, Britain was the land of the ghost story, the legend, the haunted burial mound and the sprite in the well. Perhaps this stems from the collision of so many ancient cultures – and their rich and conflicting myths – as Britain was settled and re-settled before, during and after the Roman era. Perhaps it’s to do with the influence of the Welsh, Scots and Irish on English culture, or the many dangers that “the wild” held in a land of widely varied habitats and changeable, threatening weather. What we hadn’t mastered, until Tony Whitehouse showed the way, was moving that rich world of the supernatural into the very urban, inter-connected, cynical world of the 21st Century. Being Human places the ghost, the vampire and the werewolf into our everyday reality, and manages to preserve the threat they present while mining absurd humour and touching moments from their new surroundings. The vampires in particular – always the most predatorial of the myths, at least until they were made vegetarian and sparkly for teenage romances – are both dangerous manipulators and killers, and pathetically deluded, self-important posers, who, as Mitchell points out, have been claiming their time is about to come since the Dark Ages. The werewolves are victims of their inner beast, but some of them are pretty monstrous as humans too. The ghosts, anchored by past regrets, may be a lot less dangerous, but they’re quickly revealed as the emotional heart of the impromptu ‘families’ that spring up throughout the series – and that gives them power for good and for ill.
Their habitat has changed from the dark forest to the crummy bedsit and the minimum-wage job – but isn’t that pretty much where we dump our ‘outsiders’ now? The threats to their existence come not from witchfinders and wolf hunters, but from the press, the curious, and most of all, the people they love. And wasn’t that always the way? ‘Reinventing’ or ‘reimagining’ a classic story or myth is a process of getting to the core of the story and finding out what it’s really “about” at this moment in time. Are the Sherlock Holmes stories about a brilliant detective and his assistant, or about two men who don’t really fit into their society, and find a job that allows them to interact with it from the outside? Is Robin Hood really about robbing the rich and feeding the poor, or about a world that’s crumbling from the top down, and an attempt to build a new, fairer, more stable society? Maybe, maybe not. A story varies depending on when you try to tell it. Medieval Robin Hood ballads bear little resemblance to the story we tell today, and we view Victorian tales of derring-do in Africa and India very differently to the way their first readers did. Every time we tell a story, we filter it through our own culture, preoccupations and preconceptions. That’s one of the reasons we can keep telling the classic tales – every telling is a new story. So if placing a werewolf, a ghost and a vampire in a crummy flat in Bristol can create an entire new mythology, what could you create by filtering a classic story or character through your unique point of view…? Wolfblood wins a Royal Television Society award! 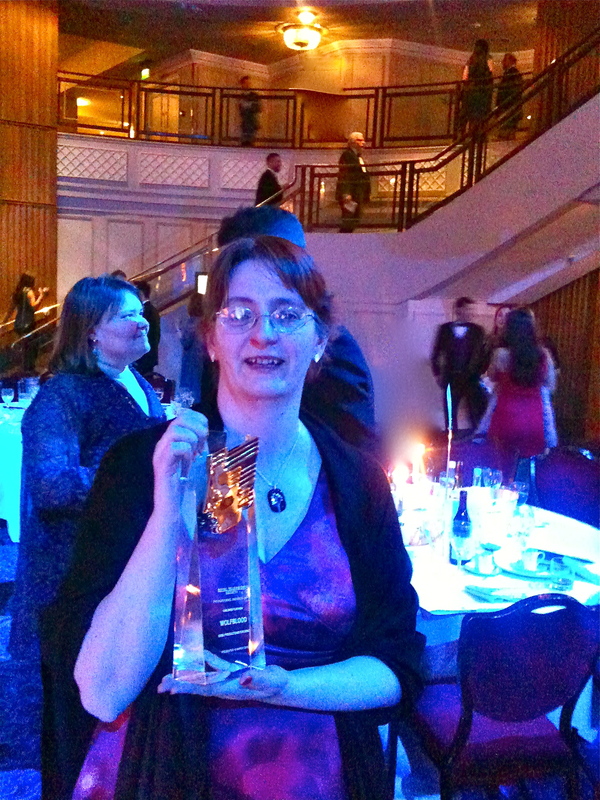 Yup, that’s me at the Royal Television Society awards, where Wolfblood won Best Children’s Drama, and I made a very bad speech, and then met Steven Moffat and geeked out a bit. The glamorous life of a writer, eh? Seriously, though, it’s fantastic for the first season of the show to have attracted so much attention, including two other award nominations and this win. We intend to keep up the good work! A lot of people seem to think writers recline on the sofa all day, waiting for inspiration to strike. On the other hand, there are all those quotes from working writers about how they just sit in a chair eight hours a day and work, inspiration has nothing to do with it. So which is true? Well, both. Inspiration is what creates the spark of an idea in the first place. Inspiration is what keeps you interested in that idea, as characters, plot points and emotional climaxes occur to you one by one throughout the writing process. Inspiration keeps you afloat as you face draft fifteen of the first episode, or yet another notes meeting with a totally different group of execs to the ones you met last time, all of whom have contradictory ideas. But inspiration is like love – you don’t *feel it* all the time. The wild flush of emotions you feel when you fall in love aren’t supposed to last through a fifty year marriage, and the first flush of inspiration won’t last through the writing of a novel or a screenplay either. But that’s fine. They’re supposed to be replaced by new emotions, a new and evolving relationship with the loved one – or the script. It’s an intriguing thought, especially when applied to Coronation Street! But actually, isn’t there something we can learn from this as writers? As we all know, every fictional character needs a flaw. Perfect people are unconvincing, undramatic, and don’t generate interesting plots and conflicts in the way that characters with flaws and failings do. And you could make the case that all character flaws fall into three categories: vampire, werewolf and ghost. The vampires are self-obsessed. It’s all about them: their needs, their wants, their desires. They’re the characters who need to learn to care about others – everyone from the grizzled action hero who needs to learn to reconnect with humanity, to the work- obsessed dad who needs to value his family above his job. The werewolves are decent people, but they’re at the mercy of their deepest desires. They’re the junkies, the alcoholics, the thieves and the people who can’t stop running their mouth. They’re the big flashy roles that stars are often drawn to, because they have a lot to overcome during the course of the film or series. And lastly, the ghosts. The ghosts are haunted by the past. They have unfinished business, physical or (more likely) emotional, that they need to deal with during the course of the story. Their story will only be over when they learn to move on and live in the present, not the past. So, is your hero a vampire, a werewolf or a ghost?